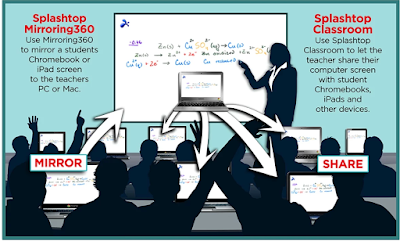 Splashtop Classroom is a great tool that allows teachers control and share lessons and presentations on their desktop with all students in class. Students will be able to see and follow everything you do on your desktop. With the recent updates, both teachers and students now can use whiteboard tools to add annotations and drawings to lesson content right from their own devices. 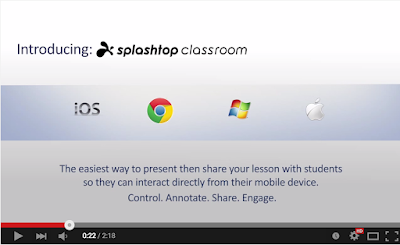 As a teacher, you can launch Splashtop Classroom on your mobile device and turn it into an interactive whiteboard. ‘Use the toolbar to draw, highlight or write over any content. Draw over flipchart backgrounds – or include your own worksheets. Use the spotlight and screen shade tools to keep students focused.’ You can move around the class while still controlling and interacting with students feedback on the lesson. You can even pass control to students and let them express their ideas by annotating and using the whiteboard features.